Last week I decided to vent some frustration. Did I find gratification in my rant? Not really. But amid a backdrop of infuriating news — the oil spill, the resurgence of the French Quarter/Frenchmen Street noise ordinance, etc. — I simply couldn’t resist. And one thing I’ve learned from living here for the past two years is that one can never really dwell on the bad for too long. NOLA is a dialectical place, a yin and yang kind of town; any bad news is always and quickly displaced by celebration and les bons temps. Sure enough, that positive energy returned last Saturday, when I spent an afternoon at Baba Blankets on Prytania. I’m sure I had driven past this store at least a dozen times before. With a bright purple façade and richly hued window drapes, the place is hard not to notice. But somehow I had managed to do just that time and again. My only excuse is that this little shop is so far down in the Lower Garden District that, by the time I get there on my way downtown, I guess my mind is already fixed on the CBD if not the Quarter. Baba Blankets is the brainchild of owner E. Aminata Brown (one of New Orleans Magazine’s 2009 Top Female Achievers). It is a small boutique featuring luxurious, handcrafted blankets, duvets and bed coverings. But it’s much more than that. Aminata created the store as a “social enterprise” collective with the unique mission of empowering the Ghanaian women who craft the merchandise. Aminata conceived of Baba Blankets following a transformative experience with an 11-year-old girl who worked as a “load carrier” in an outdoor food market in Ghana. Each day from dusk to dawn, this young girl, like hundreds of others her age, would walk miles to deliver goods for buyers, carrying everything on her head in a metal container. Born into poverty and political instability, it is nearly impossible for young Ghanaian women to find alternative work, let alone an education that might enable social mobility. Says Aminata of the young girl she encountered, “There was a connection; I saw myself in her and wanted to help.” Aminata began to ask local women to name one thing they wish they could do to empower themselves. And she was astounded by their collective response: They wanted to learn to sew. Thus emerged the mission of Baba Blankets. Since founding Baba in 2000, Aminata has helped many Ghanaian girls and women to learn and develop an important trade, one that is especially valuable in the textile-manufacturing regions of West Africa. 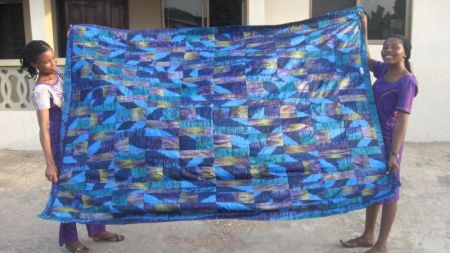 The women involved with Baba create beautiful blankets, which Aminata then sells at festivals and markets around the world, online, and at her own premiere retail location here in New Orleans. The proceeds go back to the women of Ghana, providing much-needed income and helping young girls complete their secondary school educations. Already the women associated with Baba have worked to establish the Stay-In-School Tuition Assistance program. At Baba’s “Sister Jam” event this past Saturday, I was introduced to this wonderful story. In addition, other revelers and I were treated to the sounds of Tracy and Dorsie (the iconic musicians who perform right outside of Café du Monde), Joy Clark, Zion Trinity and many others. It was a beautiful celebration of New Orleans-style soul and love. If last week prompted an outburst of negative energy on my part, a rant in response to all that is miserable and frustrating and unfortunate in this town, one simple Saturday afternoon party was more than enough to resurrect positive inspiration. To witness a creative local leader, to learn about an initiative geared at improving the quality of life of women and girls in a third world country … if that doesn’t bring a smile to your face, what does?